Launched in December 1995, EOP's Diversity Recruitment Website is a leader on the Internet for workforce diversity recruitment. Reach our online viewers on www.eop.com with your diversity branding and/or recruiting message. We offer several options based on your needs and budget. Tracking reports are provided monthly by request. Note: Only one piece of creative can be used per contract. Reach the most qualified candidates by posting your opening on EOP's Diversity and Inclusion Job Board. Employers have the use of an Easy Management Template System allowing the reuse of job postings, pre-screen filters, and automatic letters/notifications. Additional job posting features include an Internal Messaging System, an automatic Bulk Post Process, Job Alert, OFFCP Tracking, Cross-Posting, Job Wrapping (Spidering/Scraping), Feature Employer options and much more. No matter what your staffing needs or budget, we have a multitude of posting options, including 30-day or 60-day single postings, purchasing credit packs or even unlimited postings within a certain timeframe. 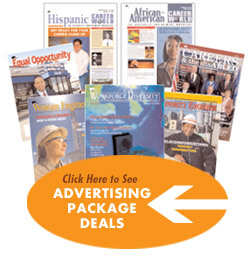 Print advertisers can now give the same printed message and image that they give to our readers to our online viewers. When online viewers click on "Companies Actively Recruiting", they will have an opportunity to view your display ad that was published in our printed magazine. This service is only available to print advertisers. View resumes from diverse candidates, both new college grads and top professionals in all fields in our database accessed through EOP's Diversity & Inclusion Career Center located on our website. The resume database is created as the perfect environment for both the active and passive job seekers.